This seems to be self-evidently true, the most interesting design thinking often emerges from difficult situations where the designer’s freedom is constrained by circumstance. I would like to offer Lukas Brunner as a particularly pointful example of this. I was intrigued, partly because I had recently returned to playing the guitar after a long period and had bought a small “travel guitar” which was quite a nice instrument but not very compact and the sound was rather thin. Two years later my Lukas Brunner guitar is my most beautiful and treasured possession. 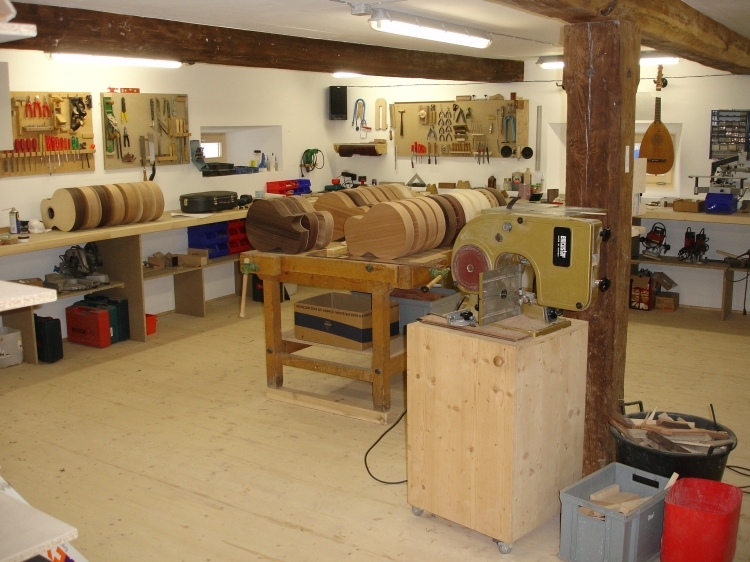 Brunner is the son of a cabinetmaker and it is clear that he inherits his father’s craftsmanship. 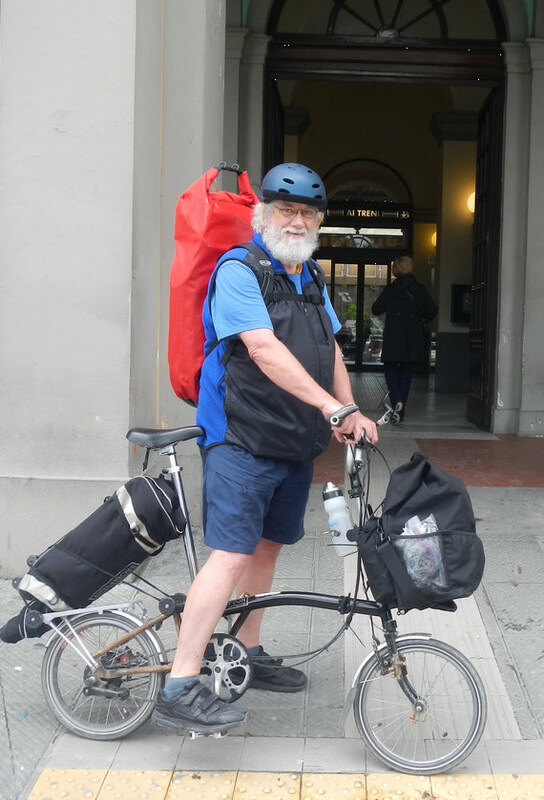 He is also a musician and a cyclist so, when planning a honeymoon trip in Australia by tandem bicycle, he decided that he really needed a guitar that he could carry on a bicycle, something that is just not practical with full-sized instruments, especially if you are carrying everything else that you need for a long trip. There is quite a variety of travel or backpack guitars available. Some, like the one I had, are scaled down versions with a small body and slightly shorter neck, well-made instruments but not capable of producing a rich sound. Others, called ‘cigar box’ guitars because of their very small, often rectangular, bodies, are even more basic. The sound is very thin indeed, maybe OK for a singalong or practice but not a performer’s instrument. The Martin Backpacker guitar, a typical ‘cigar box’ design. Compact and stylish but not an instrument for serious music making. To be fair to Martin, who make some of the finest guitars available, this instrument is around one eighth of the price of a Lucas Brunner travel guitar. 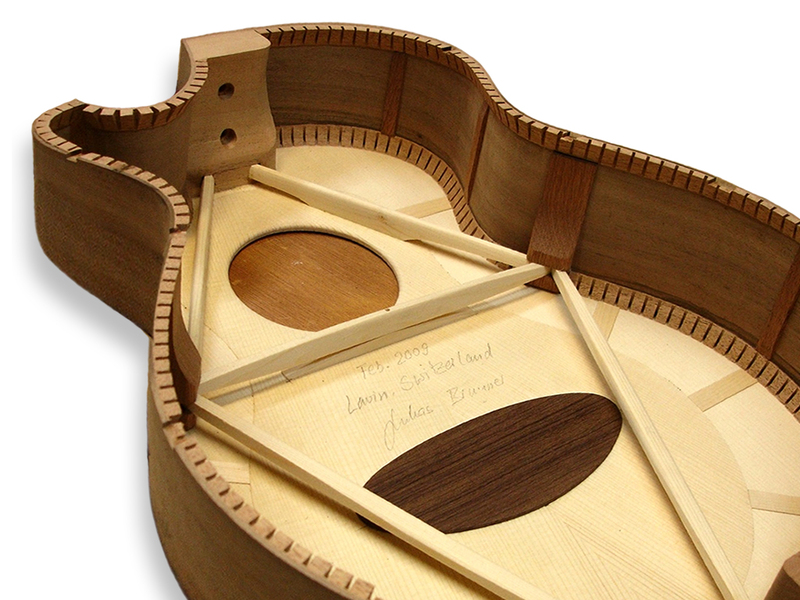 To make a perfect travel guitar, Brunner went back to first principles. The basic design idea was quite simple, a small “parlour guitar” body like the one on my existing guitar, plus a removable neck so the whole package is much more compact for travel. Skilful making and good engineering thinking were needed but so far the challenge was not too great. 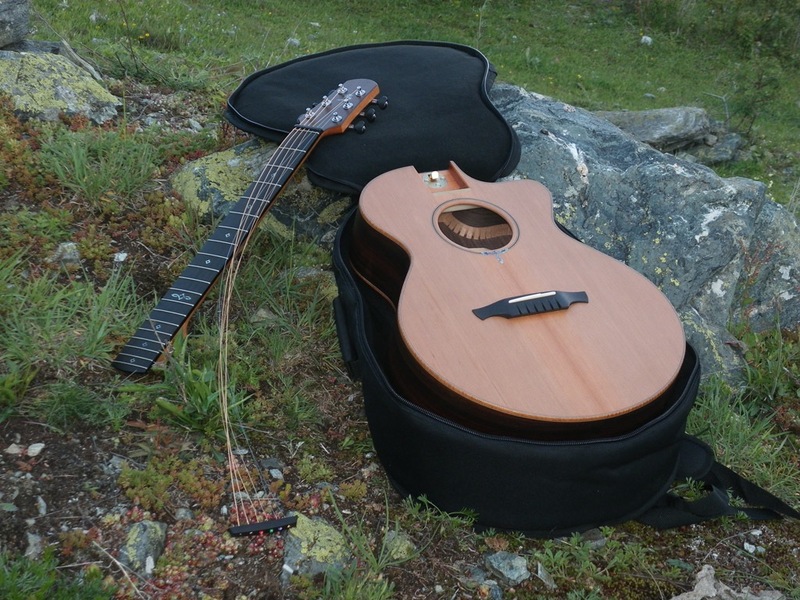 There are other guitars that fold for travel although none quite so neatly and compactly as Brunner’s, which goes into a little backpack just the right size for airline cabin baggage and reassembles in less than a minute, needing only a little tuning before it is ready to play. But that alone does not achieve much and plenty of people might come up with a similar idea. What sets Lukas Brunner apart is his determination to achieve a rich, well-balanced sound from a very small guitar and the way that led him to question some basic principles of guitar construction. The instrument on the right is the normal Brunner ‘compact’ guitar, similar to mine. The two on the left are conventional sized guitars. You can see that the compact instrument is less than half the volume of its big brothers and normally this would mean a weak sound, not suitable for most performances. 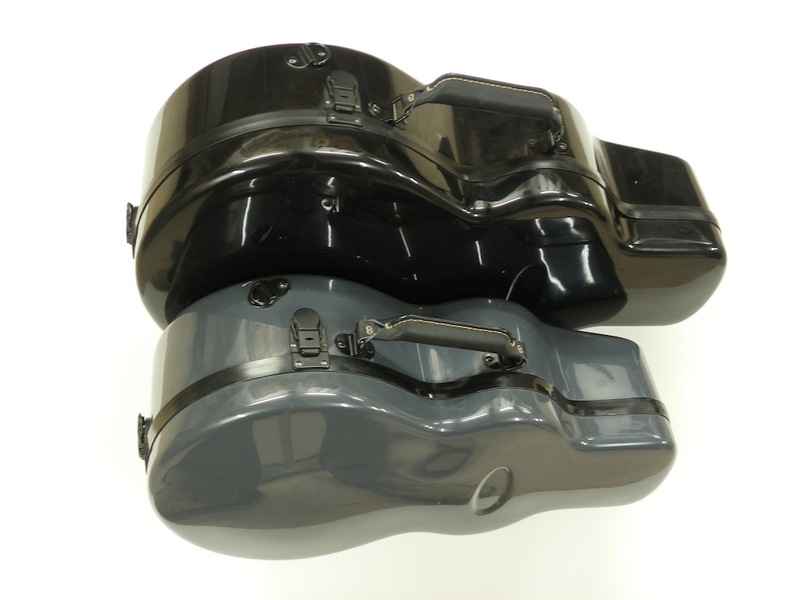 It’s easier to see the difference in volume on this photo of the cases used for the compact and medium-size Brunner guitars. In the flesh the Brunner guitars are tiny. The top of most guitars is a flat piece of wood. Without some reinforcement it would not be able to cope with the stresses from the tensioned strings so it has a pattern of strengthening ribs on its back. Brunner thought about the way these ribs divided the top up into several separate zones, each vibrating semi-independently with its own acoustic character. He realised that this made it much more difficult to achieve a good sound right across the range of notes that could be played. 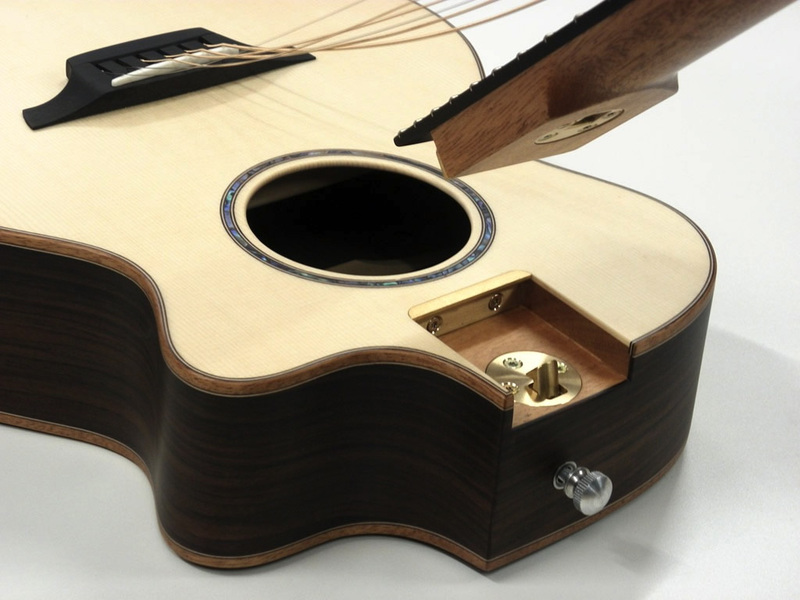 Brunner’s big innovation was his “flying top”, a design with no glued bracing so the whole top of the guitar resonates as one single piece of wood, larger than the individual zones of a larger traditional guitar. This in turn created a very rich sound right across the range of the instrument, not quite as loud as a bigger guitar but in every respect a high quality instrument suitable for professional performance. To make it work he had to rethink the whole construction of the top. First of all he slightly strengthened it by gluing a thin lamination of wood over the central area of the top. At the same time he also induced a slight curvature into the top which gave it more strength. But the key to the design was the use of a substantial wooden “bridge” across the inside of the guitar, a little way below the top, acting as a support for a small block of wood which pressed up against the highest point of the top to hold it in its curved shape even when the strings were tensioned. Inside one of Brunner’s guitars. You can see that the main brace across the centre of the guitar just touches the small saddle that connects it to the top, which is held in a slight curve by that action. The two big braces nearer to the camera do not touch the top at all. The results are sensational. 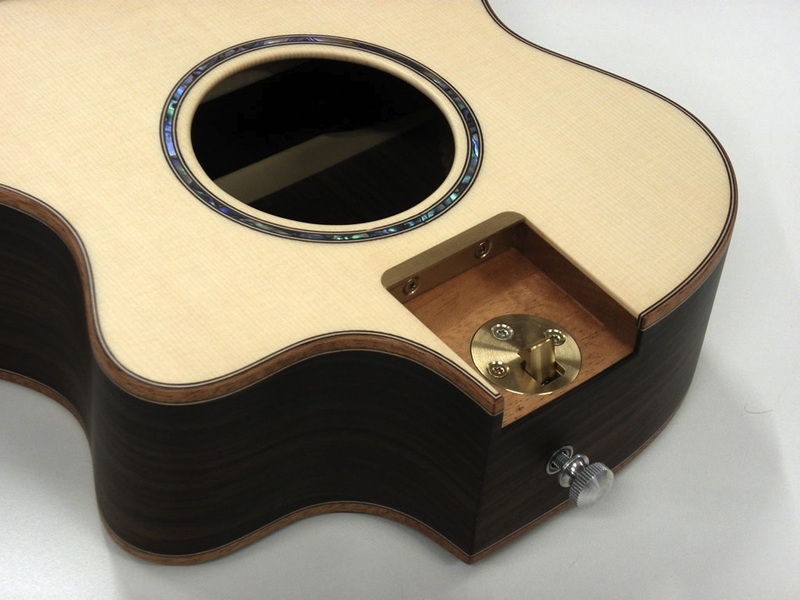 Acoustic measurements show that the top vibrates evenly across its whole area and across the full range of notes, Brunner’s design effectively removes quite a lot of the uncertainty and black art that influences the sound quality of conventional guitars. Serious guitarists who bought one of his guitars as a backup or just for personal use started using them as their main instruments for performance. I’ve had one for nearly a year now and wherever I go, other guitarists comment on the sound. It’s not just a great small guitar, it’s a great guitar by any standard. That’s not quite the whole story. 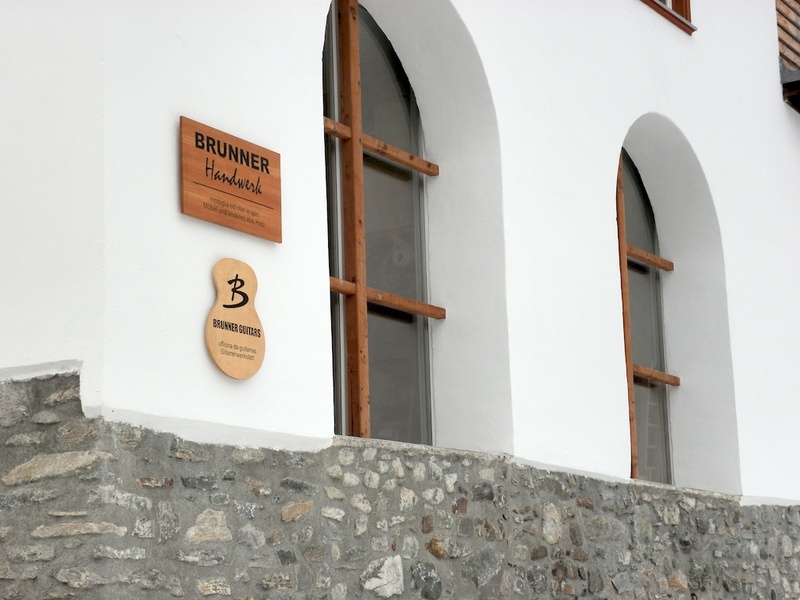 Brunner’s guitars are not cheap of course but actually the prices he charges are no higher, in some cases less, than similarly well-made instruments that lack the special practical nature of a Brunner guitar. He is not afraid of modern technology and he looks for ways to make his instruments very good value by batch production methods. His most basic instruments, while playing as well and sounding as good as any he makes, are carefully designed to eliminate unnecessary costs. 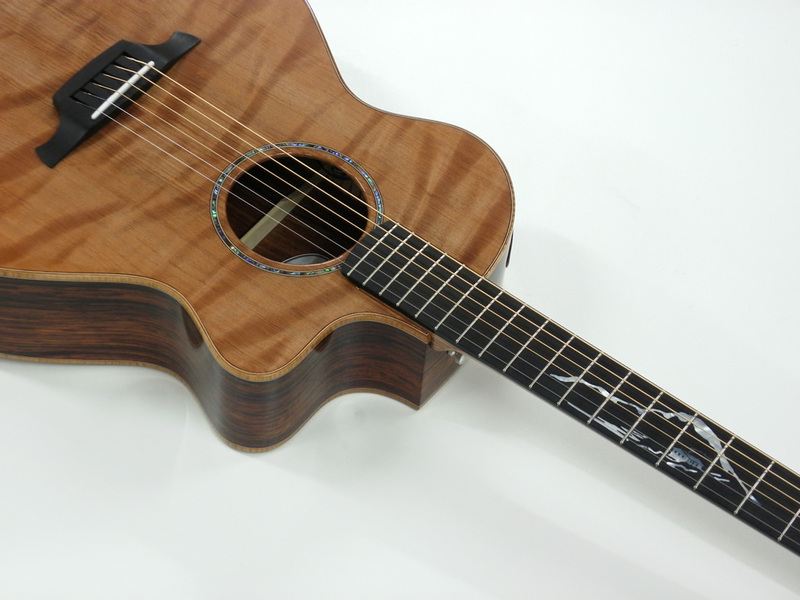 He also makes more expensive and lavishly customised instruments for those who love the individuality and character of rich materials and finishes. And after that you get the unexpected benefits. It seems to be very usual that rethinking a design for one reason may solve other problems that you were not thinking about. Since I have had my Brunner guitar I am quite reluctant to play a larger instrument and I’m thinking of selling at least one of my old guitars even though it has some worthwhile qualities. The experience of performing with a small, lightweight guitar is so relaxing and bigger ones feel so cumbersome and stressful on my posture that I feel my ageing body will only accept this activity if I stick with the Brunner guitar. On top of that is the simple fact that it is just the best-made instrument I have ever owned, by a long distance. Almost immediately I picked it up I found that I could play chords and passages very freely that would have been much more daunting on other guitars I have. I don’t consider myself to be a serious guitarist, singing is my real focus, but I have found myself able to play more delicately and ambitiously and that actually rubs off on my singing, I’m able to explore the expression in a song with much greater confidence. And finally there is the very simple but intense aesthetic pleasure of seeing, holding and using the guitar. Each time I take it apart or reassemble it (quite frequent as I take it on my bicycle to folk music clubs around the city several times each week) there’s a great feeling of satisfaction at having something so functionally beautiful. Seeing and handling the “naked” body, without neck and strings is also an unusual experience and a charming one. We are often dazzled these days by the cheapness of gadgets and the cleverness of electronic technology and sometimes we are seduced into spending our money on things of no real value. It seems to be a very good principle to consider whether to spend a big part of the money we have on something beautiful and functional that will give pleasure and satisfaction for a long time, partly because its value is not subject to fashion and its utility will not fade with use. That’s a theme I hope to return to in these posts. NB the photographs here, apart from the Martin Backpacker guitar, are all taken from Lukas Brunner’s website. 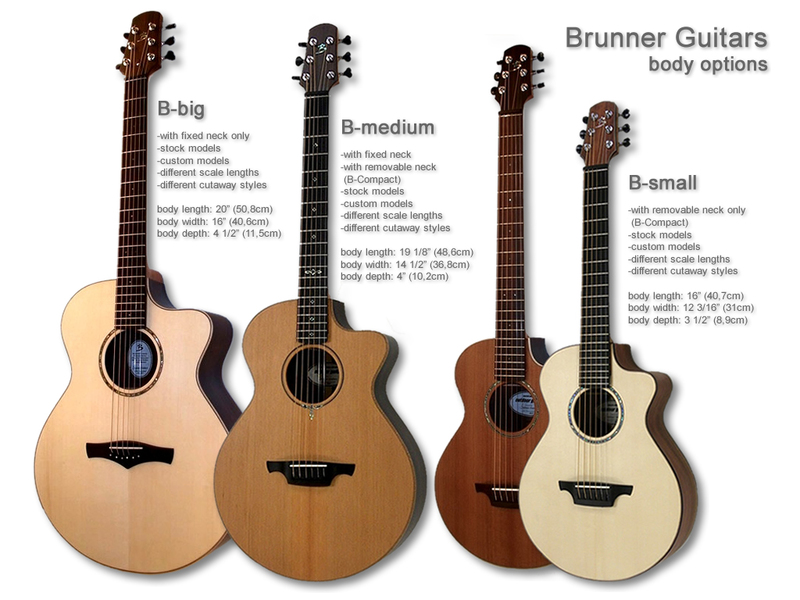 What I know about the Brunner guitars comes partly from what Brunner himself has said and from reviews by musicians and other guitar experts. However my starting point is owning and using my own Lukas Brunner guitar and the comments I have had from experienced musician friends who have heard it and played it with me. So I feel I can be confident in what I say here because, quite simply, the proof of the pudding is in the eating. The guitar does exactly what he claims it does and thus I feel enough confidence in Lukas Brunner’s integrity as a craftsman to trust those things I can’t inspect for myself, especially as he obviously enjoys the respect and friendship of musicians and luthiers who know far more about guitars than I ever will. It’s also clear that he has great pride in his work and goes to some length to “show his stuff”, you can see this in action on his website with many photographs of his work in progress. I’ve previously written about the importance of making the physical nature of designing evident as an important part of professional integrity, for designers and researchers, so I’m pleased to have such a good working example in Lukas Brunner. This entry was posted on 15 December 2013 at 11:19 pm and is filed under Craft, Designing, Making, Products, Review. You can follow any responses to this entry through the RSS 2.0 feed. You can leave a response, or trackback from your own site. Great thanks Will, I’ll update the post to give you credit. In fact I did ask Bromptontalk members who it was that made that original comment but I guess you missed that.